If it seems as though the ULC Monastery blog has been discussing the use of Bibles in government-run institutions lately, it is because the practice has been surprisingly ubiquitous. 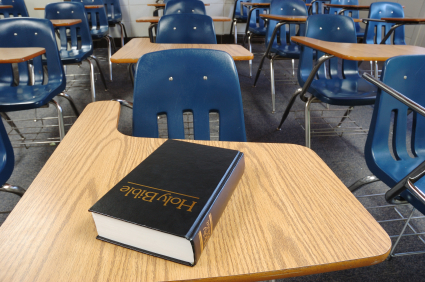 Not only has the ACLU sued a prison in South Carolina for its Bible-only policy on literature, but now a mother in Indiana is suing her local school district over Bible lessons being taught in the classroom. The case is just one of many which occur all the time in America but which, at least ostensibly, violate the Constitution of the United States. The mother, along with her son, have accused the boy’s school, New Paris Elementary, of violating the constitutional separation of church and state by teaching lessons on the Bible during school hours. On the mother and son’s behalf, the ACLU have filed a lawsuit against the Fairfield Community Schools district in federal court in South Bend. Court documents have not revealed the names of the mother and son. According to the suit, the mother requested that her son be removed from the 20-minute Bible classes, during which he was left unsupervised in the hallway; the suit also alleges that the boy was eventually moved to the library during the lessons. This is certainly not the first case in which Bible-based instruction has insinuated its way into the public schools. In January of 2010, the United States Supreme Court refused to hear a case from a Pennsylvania woman, Donna Busch, who in 2004 was prohibited by a school principal from reading a verse from Psalms in her son’s kindergarten classroom. The reading was intended as part of an “All About Me” program which spotlighted each student, their characteristics, and their favorite book, a passage from which would be read aloud by the child’s parent. Attorneys with the right-wing, conservative Christian Rutherford Institute argued that the decision discriminated against Christians and violated their free speech rights, because another parent was allowed to read about the tenets and principles of Judaism, teach students the dreidle game, and even display a menorah. However, a court of appeals upheld a lower court’s decision to forbid Busch’s reading from the Bible. If indeed the school forbade reading from the Bible but allowed another parent to read about Judaism, it does seem like a form of discrimination. However, the best solution to such a problem is not by teaching all religions, but by avoiding religion in general. In assuming a position of neutrality, not only do schools treat all faith groups fairly and avoid the problem of religious discrimination and oppression, but they also respect the fundamental principle of separation of church and state, a principle that the founders of the United States cherished specifically because of the state-sponsored religious persecution which they were well aware had plagued Europe for centuries. Of course, there is also the issue of free speech rights. Is it a violation of the First Amendment’s free speech guarantees to restrict the expression of religious beliefs in the classroom? Not necessarily. The individual does not have the freedom to express their beliefs when doing so impinges on another freedom. Teaching from any sacred religious text or holy book in a public classroom impinges on the freedom to religiously neutral government-funded education. Consequently, the individual does not have the freedom to teach from the Bible in the public classroom. This is fairly straightforward, but sometimes there is a grey area. For example, what if a teacher is wearing a small cross necklace or crucifix pendant expressing his or her faith? It is understandable to view a ban on such modest paraphernalia as draconian. And what if the teacher is treating the religious material as an object of study, not endorsement? It may still be argued that doing so opens up too many doors to outright religious instruction. Should parents be allowed to read from the Bible as part of a school lesson or unit, or should it be forbidden because it borders dangerously on religious endorsement?